The Korea Baseball Association said Tuesday the terms of Park's assignment were spelled out in a memorandum of understanding it signed with its Sri Lankan counterpart in September last year. The Sri Lanka baseball association asked the KBA to dispatch a coach ahead of the East Asian Cup tournament in Jakarta in May. Park will return once the event ends. East Asian countries excluding Korea, Japan and Taiwan take part in the tournament, which also serves as a preliminary competition for the Asian Baseball Championship. Sri Lanka, 29th in the International Baseball Federation's world rankings, is looking for its first tournament win. 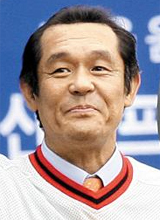 Park holds the KBO League record for most consecutive wins by a pitcher in a season. In 1982 -- during the KBO's very first season -- Park won 22 straight games with the OB Bears (now the Doosan Bears), ending the season with 24 wins, 4 losses and 7 saves.